NASA funded robotic eel project is one of the most enticing venture so far. 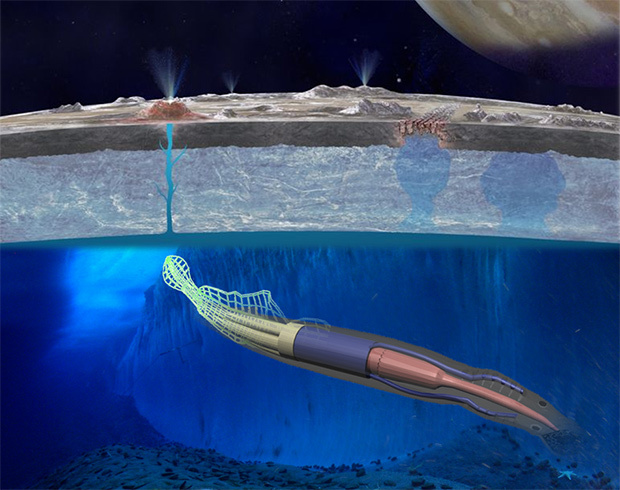 With an aim of delving deep into the ocean-bed of Europa, (Jupiter’s moon), the soft robotic eel is fabricated for scavenging electrical energy from magnetic fields and employing it for creating oxygen and hydrogen so that the machine can generate an outburst, which’ll further help for it’s propulsion. There is still more to it, the bot is sheathed with a soft flexible cover, which is not only stretchable but also electroluminescence. The concept is the brainchild of Cornell University researchers and NASA has supported the idea by bestowing grand under the NASA Innovative Advanced Concepts (NIAC) program to raise itself up from TRL 1 to TRL 2. Where TRL 1 denotes “basic principles observed and reported” and TRL 2 represents “technology concept and/or application formulated”. To attain the level of Europa’s mission, the project needs to reach TRL 9. A long way to go but with each technological advancement, the robot eel looks more promising and optimistic of course. As per the NIAC, they are looking forward to a rover’s architecture specifically for planetary environments where soft robotics facilitates exploration for scientific investigation, which otherwise is not possible with solar or nuclear power. The rover looks like squid and has tentacles for serving electrodynamic tethers for gathering power from the surrounding magnetic fields for creating propulsion in both fluid and along the surface of a planetary body. One of the main hurdles with solar power is that it is extremely difficult to harvest efficiently in planet Jupiter’s environs and impracticable to harvest at the subsurface of an ice-covered ocean as is expected on Europa. Although nuclear could be a feasible alternative but NASA has nearly canceled most of the research work that involves nuclear power sources for interplanetary exploration missions. Keeping these codes of conduct under observation, the Cornell University researchers have tried to fabricate a system that allows for harvesting energy from the strength of surrounding magnetic fields on Jupiter. 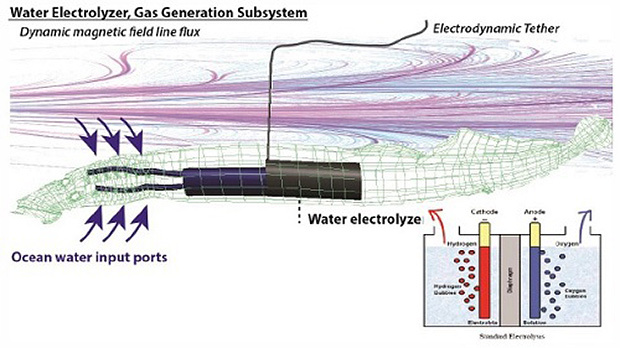 The dynamic electrical field will create enough flux within Europa’s oceans that by extending an electrodynamic tether in say a few meters away from the robotic eel would have enough potential of harvesting electricity for powering nearly all of the robot’s systems. Instead of consuming electricity directly for propelling the machine, the robot would take an efficient bio-inspired approach. At first, the electric energy would electrolyze water, thus breaking down the H2O molecule into H2 and O2. These are then led towards the storage house within the body and limbs of the robo eel. The gases are then assorted and triggered as per the requirements and this in effect would lead to the bot’s propulsion. This bio-inspired project is one of the most fascinating works so far, as it offers most practical solutions for not only powering underwater robot but also offers movement techniques within fluids across interplanetary exploration. Not to miss, the soft robotics would soon be making its presence felt for all the coming space expeditions.